EVERETT — From a vacant parcel of land, choked with weeds and framed by smokestacks and storage tanks, you can look across the Mystic River. If residents of the adjacent neighborhood had access to this section of waterfront, they might see their future. In the distance loom Charlestown and Somerville, post-industrial communities that have reinvented themselves to become among the most desirable in Greater Boston, attracting new people, businesses, and investment. Here, not far from the border with Boston, similar changes are underway as abandoned factories are converted to high-end housing and greener businesses, such as microbreweries, replace dirtier ones. That change is likely to accelerate to lightning speed should Las Vegas mogul Steve Wynn gain approval to build a $1.2 billion resort casino on that vacant property along the Mystic — a development that many agree would transform a long-struggling neighborhood, remarkable for the diversity of people, income, and land use packed into 11 city blocks. Sweetser Rotary to the north. Poor immigrants live next to middle-class whites, blacks, and Hispanics in single-, two-, and three-family homes and across Route 99 from young professionals in upscale condos. Junkyards, auto repair shops, small manufacturers, and major international corporations are interspersed throughout the neighborhood. Giant oil tanks loom over wood-framed houses. Much of what keeps Greater Boston moving is found in the Lynde. The MBTA services its fleet of subway trains here. Exxon Mobil’s tank farm stretches east to Chelsea. 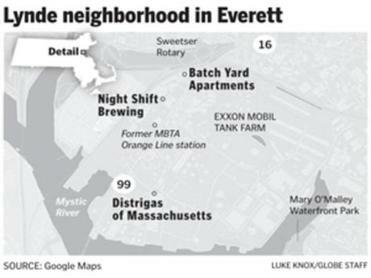 Distrigas of Massachusetts operates the liquefied natural gas, or LNG, terminal in Everett, the oldest facility of its kind in the United States. The Distrigas complex, in turn, has connections to two interstate natural gas pipelines, as well as the Mystic Power Station, just over the border in Charlestown, which generates electricity for about 1.5 million homes. The Lynde grew up at the turn of the 20th century when it was a thriving manufacturing mecca, a place where blue-collar workers, mostly Italian immigrants, lived and walked to jobs at the oil refinery, tool manufacturing plant, or Monsanto Chemical Co.
Frank Dascoli, 76, and Jim Marchant, 78, grew up in the neighborhood in the 1940s and ’50s, their families sharing a duplex on Lynde Street. They recalled the Lynde as a place of adventure, where industrial neighbors provided their playgrounds. In winter they ice-skated around oil tanks, and in summer they swam in the polluted Mystic, admiring the greens, blues, reds, and yellows spreading on the surface, and risking a spanking when they returned home. 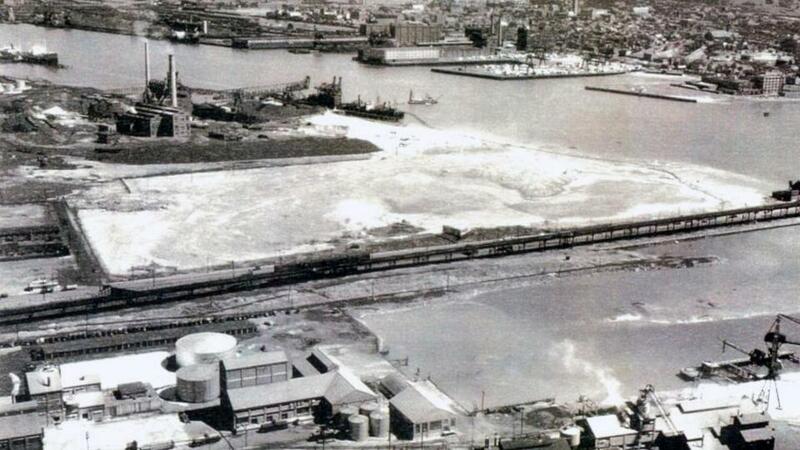 A view of the Monsanto Chemical property in the 1920s. Today, the neighborhood is a mere remnant of its industrial heyday, dotted with a few vacant lots, abandoned homes, and empty factory and commercial buildings, including the former Esso Office Building on Beacham Street, where graffiti and boarded windows tower over a small patch of unruly weeds. Until a few years ago, revitalizing the neighborhood was never a priority for city officials, who long hoped that manufacturing would return. When it became clear it wouldn’t, they began looking for other ways to improve the area. Signs that the neighborhood was changing first appeared in 2005 when the former Charleston Chew candy factory was converted into a 69-unit condominium development. Nancy Koury and her husband, Steffen, were among those who bought, lured by an easy commute to their respective jobs at a Boston law firm and product design company. 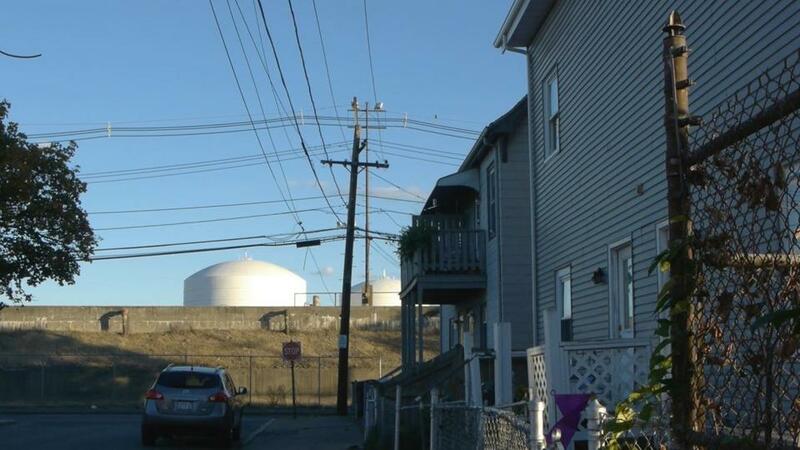 LNG storage tanks seen from Robin Street in the Lynde. The Kourys bought two units with exposed brick walls and ceilings with aged wood beams, then combined them into a penthouse suite with a deck and skyline views of Boston. Nancy Koury said it was an opportunity to get more for their money than in other Boston-area neighborhoods, including the Charlestown Navy Yard, where they once lived. 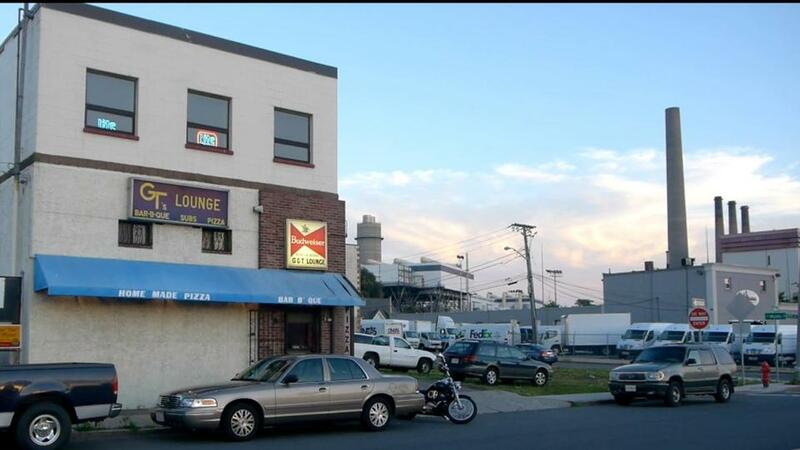 “We pretty much fell in love with the space,” said Koury, who today is a member of the Everett Planning Board. The city had plans to improve the neighborhood at least two years before Wynn set his sights on the former Monsanto property in 2012 as the location for his company’s casino. Over the past couple of years, it has repaved Route 99, added a bike lane, and installed new lighting. City officials also plan to study the feasibility of adding a commuter rail stop along tracks on the west side of Route 99. Robert Burns is cofounder of Night Shift Brewing, one of two breweries in the Lynde. In the three years since the microbrewery opened on Charlton Street, Burns said he’s noticed new businesses, more young people, and more activity in the neighborhood. Smokestacks loom large from this vantage point on Bow Street. Developer Andy Montelli is betting on that. His company, Post Road Residential of Fairfield, Conn., is building the $91 million Batch Yard luxury apartments. Although rents have yet to be set for the 328 units there, they are expected to be lower than advertised rents in similar projects around the area. Montelli had plans to build here before Wynn Resorts proposed the casino on the former Monsanto property. Later this year, the state Gaming Commission will decide whether to award the sole license in the Boston area to Wynn or to Mohegan Sun, which has proposed a casino for the Suffolk Downs racetrack property in Revere. If Wynn gets the license, Montelli said, he is hopeful that the casino would make the neighborhood and his development more attractive. Other restaurants, hotels, and shops would likely open along Route 99, providing additional amenities for residents. “When you put a billion dollars into a place, there’s got to be some spillover effect,” he said. 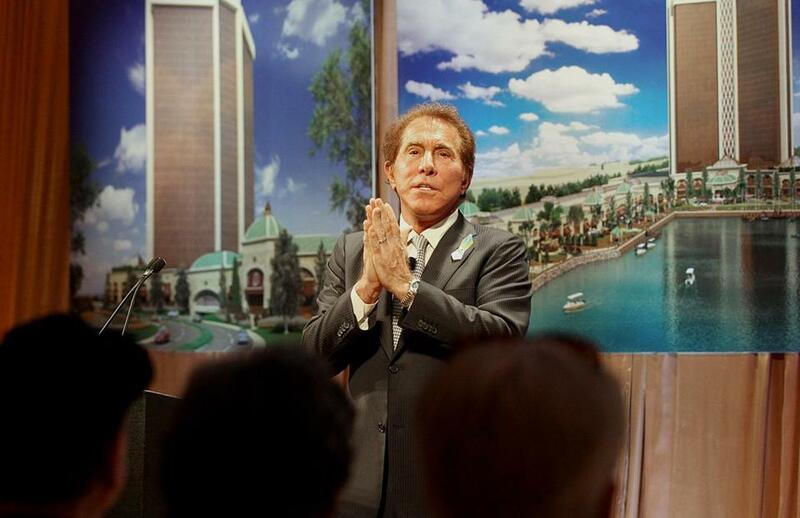 Las Vegas developer Steve Wynn gave details of his casino proposal last year in a meeting with Everett residents. That spillover would almost certainly wash away some of the neighborhood’s diversity, said Phil Bronder-Giroux, executive director of Tri-Cap, an antipoverty agency that serves Everett, Malden, and Medford. He said the casino and the city’s revitalization plans will lead to higher rents, making the neighborhood unaffordable for many longtime residents. “I can say pretty assuredly to you that the people who are living there now won’t be there [if] the casino gets built,” said Bronder-Giroux. Even if Wynn’s plans are rejected, city officials say, the neighborhood is gaining momentum, enough to continue its upward swing. They believe they could lure other development to the former Monsanto site that would contribute to the area’s revitalization. This article was adapted from the documentary “Down the Lynde: A Neighborhood on the Verge of an Industrial Breakdown,” by Mark Micheli. The 67-minute video will be shown Wednesday, June 11, at 7 p.m. at the Malden Public Library, 36 Salem St., Malden. Micheli can be reached at markfmicheli@gmail.com.